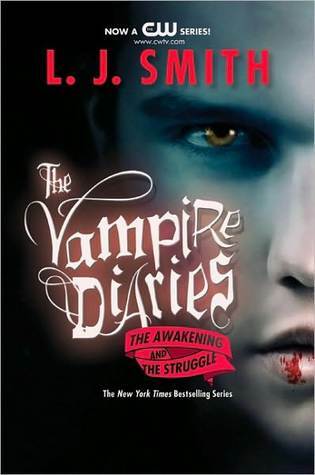 The Vampire Diaries Week is filled with all sorts of fun, entertaining and enjoyable events! Reviews of all the books in The Vampire Diaries series, guest blog posts from other Book Bloggers, informational posts about differences between the novels and the TV series, and a closer look at the relationships between Stefan/Elena and Damon/Elena, and much more! “And so,” she said, gazing into his eyes. “I have had a present made for you.” She took his hand and pressed something into it. When he looked he saw that it was a ring in the same fashion as her own, but larger and heavier, and wrought in silver instead of gold. Pride and rapture made him mute. He reached for her hand to kiss it, wanting to take her into his arms right then, even in front of Damon. But Katharine was turning away. Elena stared at him. Of course it wasn’t her choice, if he meant romantically. She was wearing the ring Stefan had given her; she and Stefan belonged together. But then she remembered something else, just a flash: looking up at Damon’s face in the woods and feeling such – such excitement, such affinity with him. As if he understood the flame that burned inside her as nobody else ever could. As if together they could do anything they liked, conquer the world or destroy it; as if they were better than anyone else who had ever lived. Without a thought of herself, without a thought of any kind, Elena did what she did best – gave in to impulse. She threw her arms around Damon’s neck and kissed him. She couldn’t think properly. Damon was gazing at her with wonder and a look she was all too used to seeing – but she couldn’t remember where. Elena had lost the power to analyse. She was simply basking in the warm glow of being cherished, being held and loved and cared for with an intensity that shook her to the bone. And when Elena gave of herself, she gave completely. Almost without conscious effort, she arched her head back to expose her throat, and closed her eyes. Damon gently positioned her head differently, supported it with one hand, and kissed her. Teaser Tuesday is so much fun! Here is mine. Please drop by and say hello! I’d love to hear from you. Love the TV show but I haven’t read the books. They sound really good. Your teaser makes me wish to look out for this novel! Here is my Teaser Tuesday: The Noah’s Ark Quest by Boyd Morrison post! What some fantastic teaser lines, when you read them all together like that. They even make me want to venture into the unchartered territory of the paranormal genre, so watch this space. I particularly like the cover of ‘The Awakening And The Struggle’. Only downside … if you have been following my blog, you will know how notoriously bad I am at reading a series of books together and in order!!! and this is something that definitely needs to happen with this series of books…..
I’ve noticed all of your teaser lines include Damon. I confess I would also choose lines with him,because he’s my favourite character of TVD. Loved them all! Haha yes…I couldn’t help myself! I went searching for Damon quotes right away, as soon as I opened up the novels. I’m Team Damon all the way, guess it shows even here! Awesome teasers! And making all those teasers with Damon in them makes them even better!